More than 50 local people came along to our Tune In To Cricket Green event on 7th March in the Vestry Hall. This was jointly organised by Mitcham Cricket Green Community and Heritage and Merton Council. There was lots of lively discussion about what people like about the area and what they want to change. We talked about a number of key potential development sites including the Fire Station (which will become vacant when the Fire Brigade decamp for new facilities near Mitcham tram stop), the Cricketers Pub (subject of three planning applications for flats all turned down on appeal), Worsfold House and surrounding open space, the Canons area, the Wilson Hospital and Birches Close. 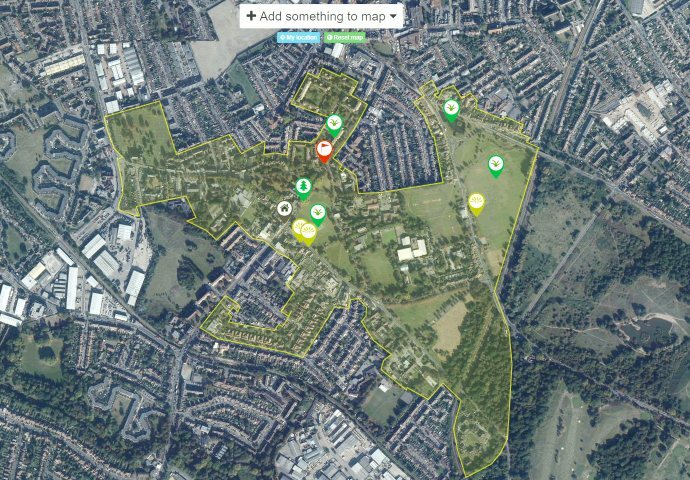 Local people expressed strong views about what they did – and did not – want to happen in and around Cricket Green. Ideas ranged from new hotels, an arts centre, housing and efforts to tackle lorries and other traffic. There was strong appreciation for the historic character and open spaces of this much loved area. All three Cricket Green Ward Councillors took part in the event, as did key staff from the futureMerton team. Cabinet member Andrew Judge also attended. There will be a full write up of this event available soon. We’ll publish it here, so watch this space. There are some photos here. This will be used to help Merton Council understand how the local community wants to see Cricket Green change in the future. We would like to thank futureMerton for its support in helping to run this event. This entry was posted in Cricket Green Conservation Area and tagged Cricket Green, development, future of Cricket Green on March 9, 2013 by mitchamcricketgreen.